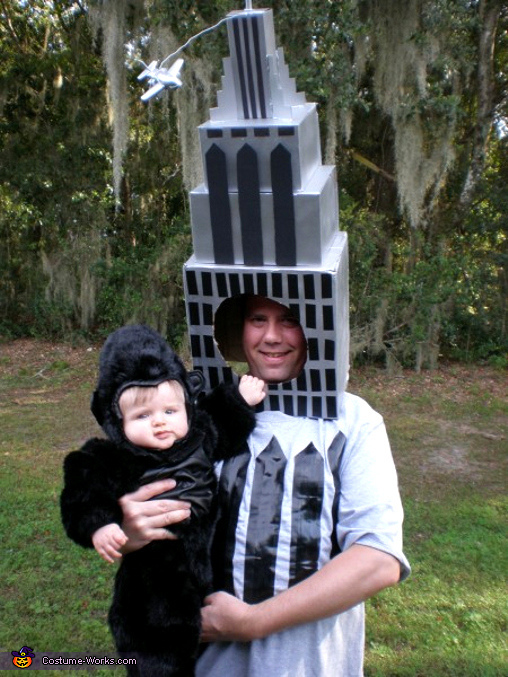 This is a photo of my husband Todd as the Empire State Building and my son Max as King Kong. My husband dreamed up this idea while we were pregnant with Max. He told everyone how he was going to be the Empire State Building for Halloween and Max would be King Kong. So, of course, mommy had to make dreams come true! I made the Empire State Building out of cardboard boxes, shoeboxes, a contact cleaning solution box and a toothpaste box. I pulled a lot of pictures of the Empire State Building off of Google for reference. I spray painted it with silver paint. There was also a lot of glue involved. I used black construction paper and black electrical tape for windows on the building and on the shirt. We had fun making this costume and I wish Halloween was more than just one day so we could show it off more!